With Fall creeping on us , I was inspired to look up colorful shoes. I recently wrote about shoes with the something blue post. I think wearing a non traditional white shoe is an excellent idea. Why not add color to the dress? Nina the queen of bridal shoes had some amazing pumps that can be worn with the elegant gown. Additionally, I had to add my wish list as well. 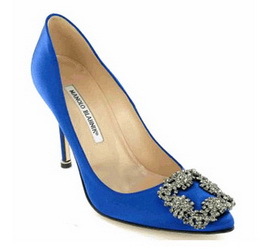 I love the blue Manolo Blahnik pumps.